Code management startup JFrog Ltd. announced Thursday the completion of a $165 million funding round led by New York-based Insight Venture Partners. Geodesic Capital and Spark Capital also participated in the round, joined by existing investors including Dell Technologies subsidiary VMware Inc., Battery Ventures LP, Scale Venture Partners, Gemini Israel Ventures, and Qumra Capital Management Ltd.
Jeff Horing, co-founder and managing director at Insight Venture, will join JFrog’s board of directors, the company said in a statement. 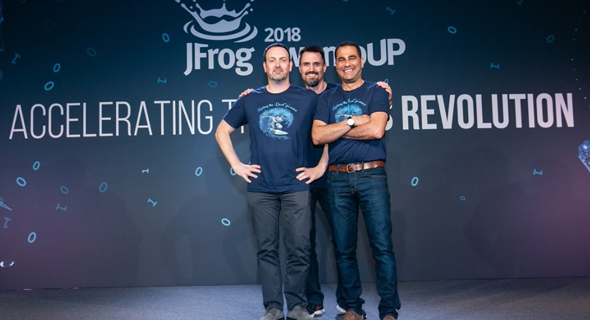 Founded in 2008 by Shlomi Ben Haim, Yoav Landman, and Frederic Simon, JFrog develops tools designed to streamline the coding process and automate software updates. The company reports over 4,500 customers including Amazon, Google, Bank of America, Uber, and Netflix. Since its previous funding round in 2016, it increased sales by more than 500%, the company said. Thursday’s investment brings JFrog’s total equity raised to around $230 million. JFrog employs 450 people in its offices in Sunnyvale, California, Israeli coastal town Netanya, Beijing, Toulouse, and Bengaluru, India. With the additional funding, the company plans to double its workforce. The company said it would hire 150 people to join its offices in Israel. In a phone call with Calcalist Thursday, JFrog’s co-founder and CEO Ben Haim said a “very minor” part of the equity raised came from a secondary sale of stocks by company employees and investors. “The employees stand behind the company’s success,” he said. Last week, JFrog announced that it bought Israeli software startup Trainologic Ltd., which provides end-to-end development, consulting, and training services to software companies such as AT&T, Cisco Systems, Amdocs, and Outbrain. JFrog said it intends to turn Trainologic into a new DevOps consulting unit within JFrog.